I knew real life would get in the way of this blogging and creativity. I just thought it might wait til we were actually in production. Ah well. This is a cheating post, really… made this a few weeks ago but (a) have only now had time to take photographs and write the post* and (b) if I don’t post this, this blog is going to get cobwebs on it. And I have enough trouble with the actual spiders in my house, without having them here too. *I wanted a sleep in til 9am – a whole three extra hours as a Saturday treat. I woke up at 7am…..so I’m snapping photos, blogging, doing my 3 mile run and weeding the garden in my spare hours. It’s that or do the work I brought home. Anyway…. I have a thing about laundry baskets. As in, I hate them. In my life, I’ve only ever met 2 that I liked. The one I bought was a wooden frame with a bag type fabric hanging on it, which died ridiculously quickly. The other one was £28 (US$43.60, Canadian$44.21, AUD$42.61 – I think that covers my readership, see, I do these things just for you!). Why is it they are so unattractive? I love wicker baskets normally, there are quite a few in the house, holding logs and paper for the fire, and the basket I use to take the laundry from the washing machine outside to the garden to hang it out (which I would do normally, in July, were it not PEEING WITH RAIN) is a wicker one, with a linen lining. I’m blessed with a fairly big bathroom. (The rest of the cottage is tiny. Go figure.) It has sloping ceilings, under which are two big cupboards, with lots of shelving and I keep my clothes in baskets on the shelves (yes, my name is Jack, I have an organisational problem). I liked to get dressed in the bathroom, partly because I’m an “out the house 15 minutes after I woke up” kind of girl, and partly because that’s where the only mirror is, so it makes sense to me. And possibly only to me. So equally, it’s where I get undressed too, hence my need for a basket in the bathroom. But I couldn’t find one that fitted in. Wicker warps and stains too much in a steamy room and my shower likes to wash the floor while it’s washing me, so that’s why I don’t use the wicker one. Plus, who wants to see dirty laundry? Not this bunny. Plus I wanted something that didn’t take up too much space either, and something that looked right, which means in a little country cottage probably not metal, unless it’s cast iron and about 700 years old. So what to do? I was randomly thinking of something totally unrelated when inspiration hit. (It’s not just me that does that, right?….) I was thinking back to school when I was 6 or 7 (it took a while, but I got there). We had a little room where we hung our coats on pegs and on gym day, we hung our gym bags there. 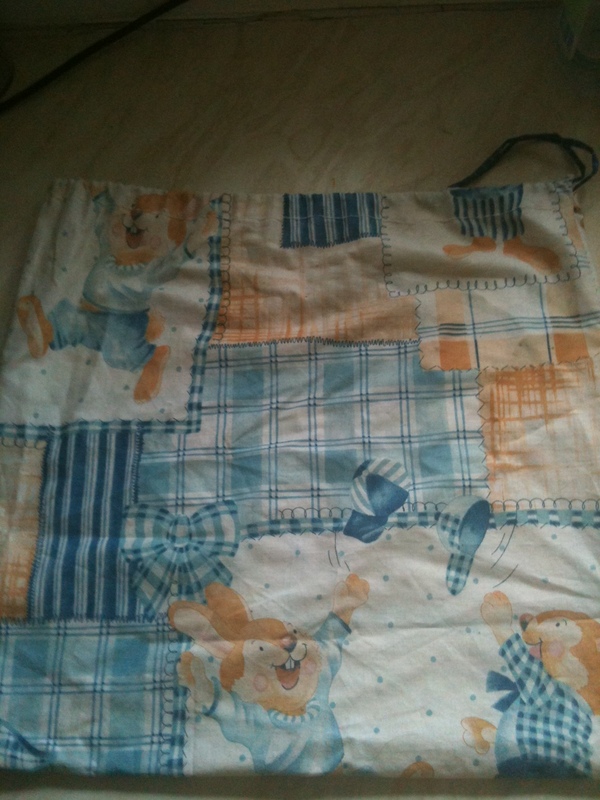 My mum made my favourite gym bag, from blue and white checked gingham, and a length of twisted cord. When I had the first three bunnies, they had a (homemade) elaborate housing system, with several tiers, and I made cushions out of material I bought specially. I still had some of that material (why yes, I do hoard things, thanks for noticing) and as my bathroom is cream and blue, I decided to use it. Cute, huh? Plus, on early mornings, whose day isn’t made a little bit more smiley by seeing bunnies? So, I cut a long rectangle, folded it in half inside out, stitched up the two edges. 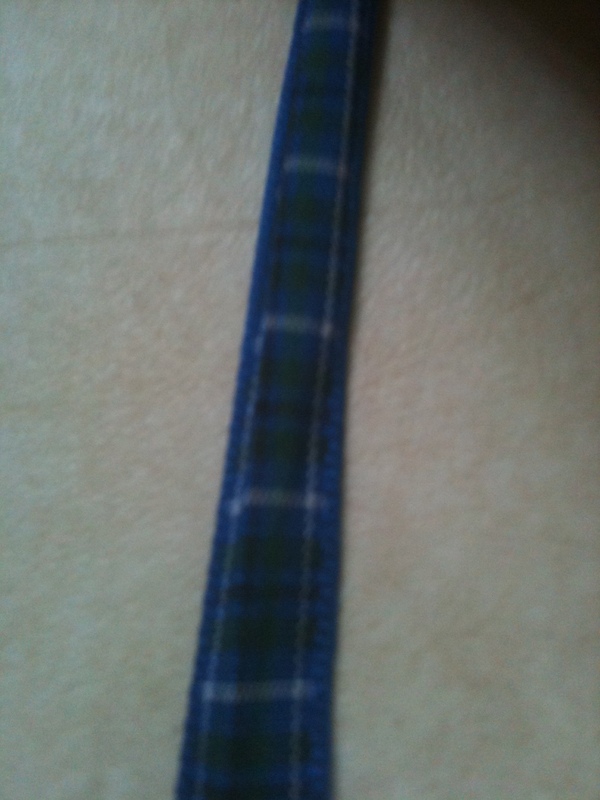 Then I a folded the top edge down, about an inch and a half and stitched that. Then, I went hunting for some kind of drawstring. That’ll do nicely. Then I did one of my favourite party tricks. 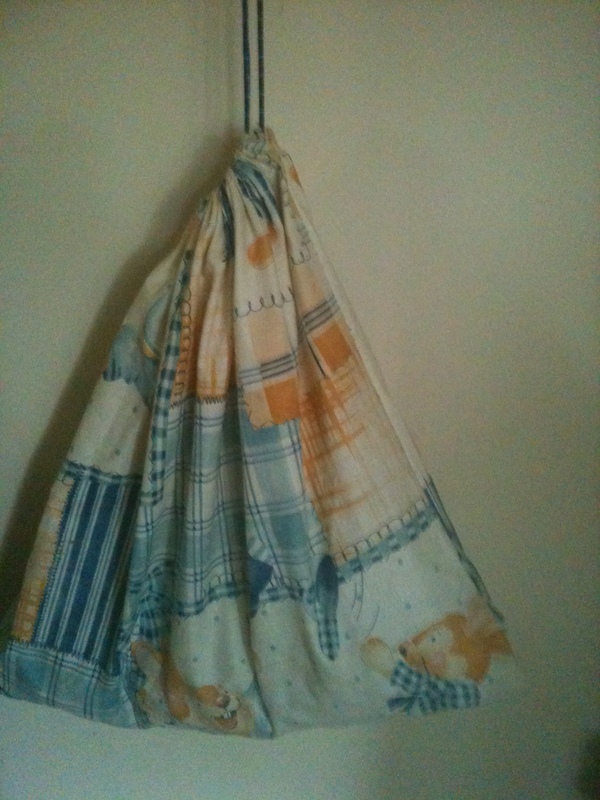 Big old-fashioned nappy pin, stick it through the end of the ribbon, feed it through the channel at the top of the bag. Because the head of the pin is so big, it’s really easy to push it along the channel until it pops out the other end and I just tied the two ends together. It now hangs on a handy hook on my bathroom door; it doesn’t take up floor space and it makes me smile. Sure, it won’t fit a massive amount, but I’ve compromised by putting the wicker basket in my “craft room” ie, the bit of space between the bathroom and my bedroom, where it’s mostly hidden out of sight by the stair bannister, so I can drop bulkier items in on my way to bed. Se there you have it. Something really easy and great for beginners and really obvious, but you know what? It works. And anything that can help keep me organised has to be worth sharing?! 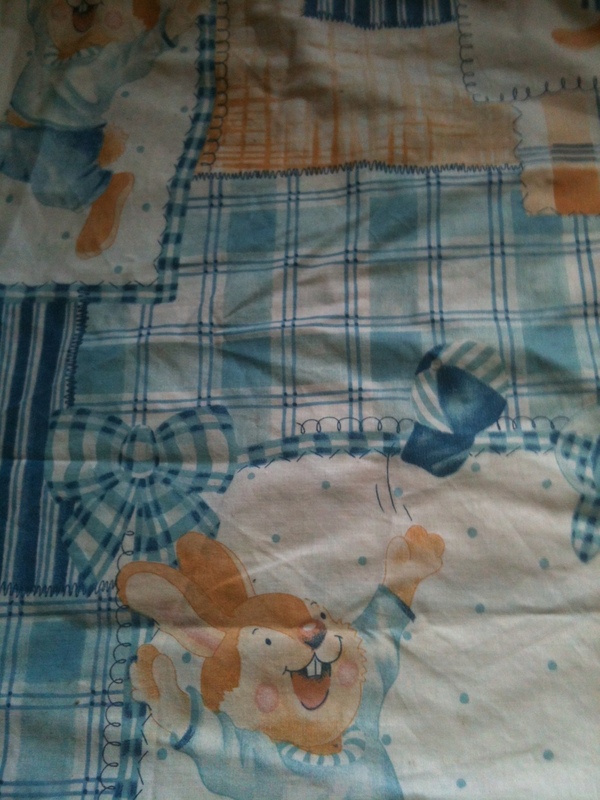 This entry was posted in sewing and tagged bunnies, sewing.